Ulaanbaatar /MONTSAME/ At the Stock Exchange trades on Tuesday, a total of 80 thousand and 783 units of 16 JSCs were traded costing MNT 265 million 521 thousand and 638.00. “Merex” /56 thousand units/, “Genco tour bureau” /9,680 units/, “Remikon” /7,013 units/, “APU” /3,183 units/ and “State Department Store” /1,344 units/ were the most actively traded in terms of trading volume, in terms of trading value were “APU” (MNT 11 million 241 thousand and 170), “Merex” (MNT four million and 984 thousand), “Merex” (MNT one million and 530 thousand), “Genco tour bureau” (MNT 774 thousand and 400), “State Department Store” (MNT 672 thousand). The total market capitalization was set at MNT one trillion 261 billion 183 million 042 thousand and 333. The Index of Top-20 JSCs was 12,805.49,decreasing 0.04% and the all index of MSE was 940.21.
to consult it with affiliated Standing committee. The Convention has been ratified by governments of 47 European Union member states and by 19 non-members, including the USA, Australia and Japan, where our citizens work and study in relatively great numbers. By joining the Convention, Mongolia will exchange convicts with the Convention’s member-countries. 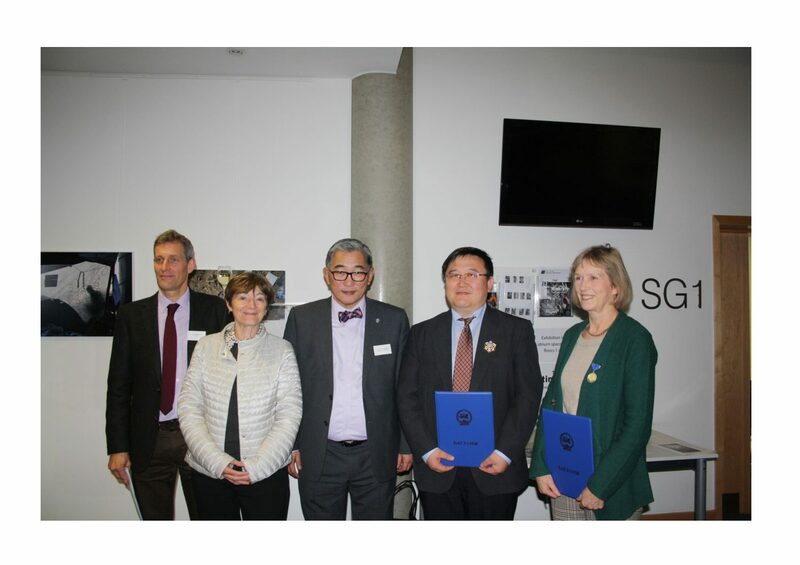 The Government is collaborating in exchanging the convicted and assisting in the transfer processes with several countries, where Mongolian nationals travel to on purposes of study, work and business, and have come to become subjects to criminal cases. Mongolia has signed bilateral agreements with seven countries so far, which legalized the convict-transferring procedures. As for the countries without any regulations regarding the procedures, it requires some diplomatic measures. Ulaanbaatar /MONTSAME/ Such a draft was presented to the Chairman of the State Great Khural Z.Enkhbold by the Minister of Finance J.Erdenebat on May 11. The amendments concerns the taxation and reporting issues. According to the General Tax Law, the final dates for paying and reporting of any kind of taxation are resolved to be simultaneous, while the Law on Mineral Resources says the entities should pay the quarterly royalty payments within the next quarter and to submit the monthly report by 20th of a next month. As the two regulations contradict with each other, it puts more burden on the tax authorities, as well as on the taxpayers, said the Minister. 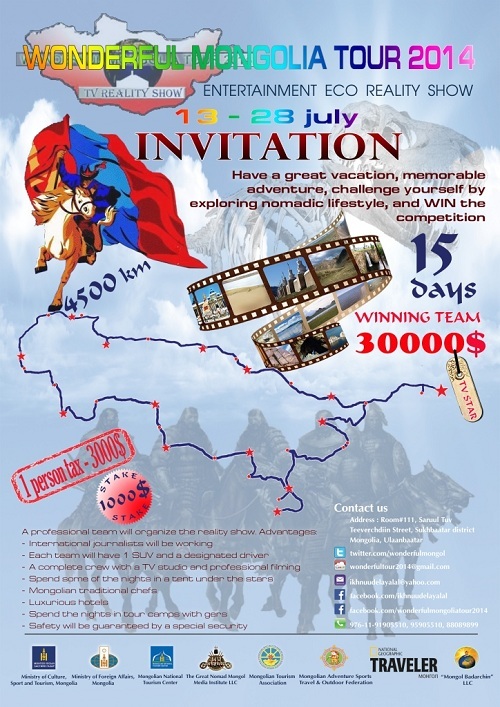 The Embassy of Mongolia in London is inviting you to join a CAMEL RACE DAY charity event, which is being organized by the Wild Camel Protection Foundation on Sunday, 7 September 2014 at Hole Park, Rolvenden, Kent TN17 4JA,England. The Government of Mongolia has made a decision on exempting passport holders of 42 countries, travelling to Mongolia, from visa requirements. According to the Government decision, passport holders of the below listed countries may travel to Mongolia for tourist and/or business purposes without visa and stay up to 30 days, from 25 June 2014 to 31 December 2015. Please note that visa fee is non-refundable. The Embassy will not reimburse the fee paid before this date. We invite you to participate in the fun and adventurous eco-reality show. 1. 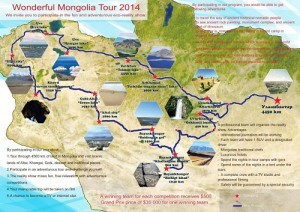 Tour through 4500 km of land in Mongolia and visit scenic lands of Altai, Khangai, Gobi, dessert and historical places. 2. Participate in an adventurous tour and challenge yourself. 3. The reality show mixes fun, free relaxation with adventurous competitions. 4. Your memorable trip will be taken on film. 5. A chance to become a TV or internet star. Bringing together business people, entrepreneurs and investors to discuss how they can collectively take advantage of Mongolia’s next phase of growth. Presented by the Mongolia Economic Forum, the Mongolia Business Summit will focus on global partnerships to facilitate business growth. A “deal-driven” approach enabling entrepreneurs, investors, bankers, both local and international, to interact directly will be used. A huge focus of next month’s summit is to introduce corporations, bankers, investors and entrepreneurs, both local and international, to discover how they can explore the untapped potential of one of the world’s fastest growing economies. International and local business people experiencing success in Mongolia will share unrivaled, first-hand experience of growing their business in this emerging market. Mr. Robert Friedland is also expected to attend the Summit. With one of the world’s fastest growing GDP rates at 9.5% in 2014 and 10% expected in 2015 (Asia Development Bank), Mongolia is setting the foundations for a period of high and steady growth expected in 2015/2016. 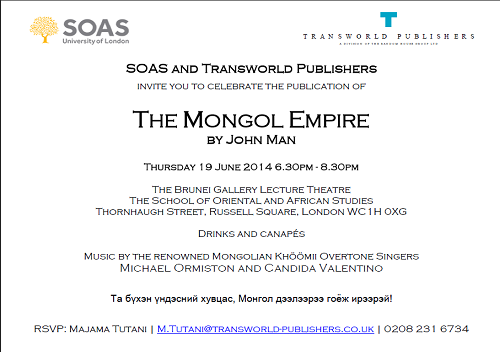 Mongolia serves as a key platform for markets in China and Russia. This landlocked nation is ideally situated between two influential neighbours with large economies. The country’s target growth sectors, including agriculture, infrastructure, mining, real estate and manufacturing, will be explored at the event. Representatives from each of these sectors will also attend. Participants have the rare opportunity of opting to visit various sites including cashmere factories, agricultural and food processing facilities, manufacturing plants and a mining site. 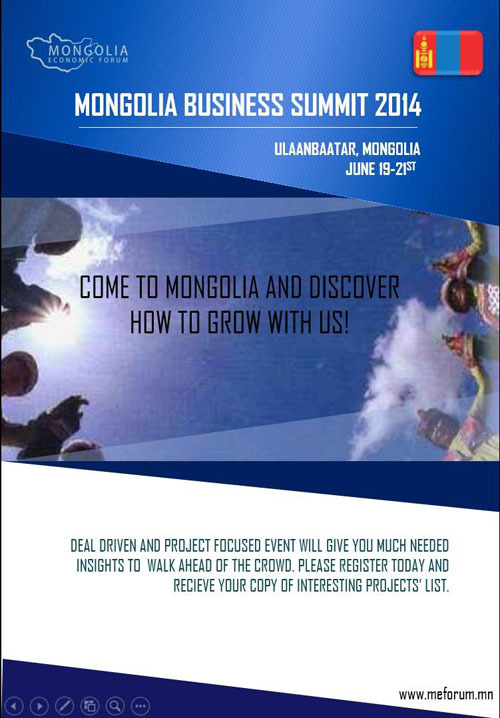 Join us for the Mongolian Business Summit from June 19-21, 2014 in Ulaanbaatar, Mongolia. 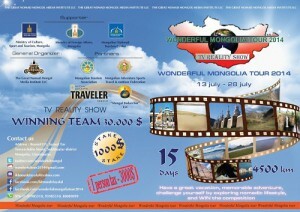 For further information please contact or visit www.meforurm.mn, www.business-in-mongolia.mn . 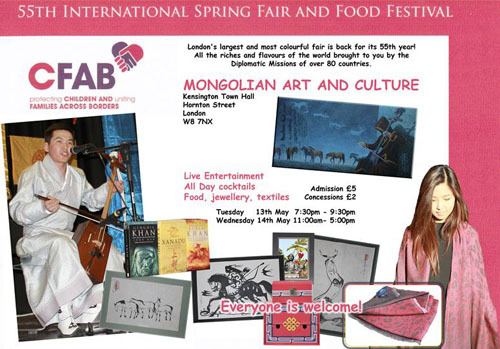 Mongolian Embassy in the UK together with the Mongolian Art and Culture in London is delighted to represent Mongolia at the 55th Children and Family Across Borders (CFAB) International Spring Fair and Food Festival on13th & 14th May 2014 due to take place at Kensington Town Hall in support of their charity work for protecting children and uniting families across borders. Diplomatic missions of over 80 countries based in London will bring their art, culture and food over two days. There will be all day live entertainment, cocktails, sale of arts, crafts, souvenir items, textiles and food in support of a good cause. Proceeds will go to CFAB. 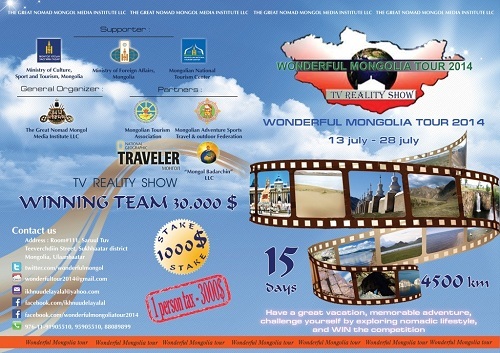 We cordially invite everyone to visit Mongolia stalls throughout both days. 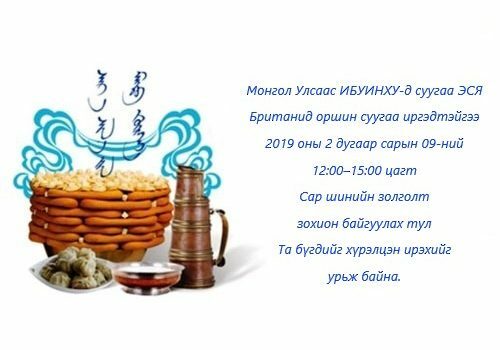 We will have paintings and paper cutting artworks by Mongolian and international artists, Mongolian souvenirs, cashmere , food as well as books on Mongolia, Genghis Khan and Kublai Khan. Mongolian music entertainment slot is scheduled between 3:30-4:00pm on 14th May on the Great Hall Stage provided by N. Bat-Erdene, a Khöömii (overtone/throat) singer and morin khuur (horse-head fiddle) player.